Congratulations to Yoomi Lee of Las Vegas Ballet Company for being voted “Best Ballerina” of 2013 in Las Vegas by readers of Desert Companion Magazine! Her elegance has graced the stages of Las Vegas for more than a dozen years, and brought the love of ballet to countless students at Kwak Ballet Academy. Having written about Lee and her husband in a previous blog, it is a pleasure to congratulate her on her well-deserved recognition by the community! I met with Kyudong Kwak, artistic director and founder of the relatively new Las Vegas Ballet Company and Kwak Ballet Academy, and chatted about the state of the arts and culture in Las Vegas, the challenges of starting a new business, his feelings about dance, and the ever-increasing hurdles to mounting a ballet performance in Las Vegas. Andrea: Many people say there is no culture in Las Vegas. How do you feel about that? Kyudong Kwak: They are right! For a city this size, there is very little culture, compared to other cities of the same population. Las Vegas is quite large, yet has a surprising lack of visual and performing arts. I’ve performed in many cities and countries, and every city seems to have more cultural offerings than Las Vegas. And other cities promote ballet and fine arts really well, so why not Las Vegas? Las Vegas is the “Entertainment Capital of the World”, so ballet and fine arts would create more balance and give visitors and residents more options in entertainment than circus shows and other production shows. I feel that this is a huge drawback for businesses, in that if a business is thinking about coming to Las Vegas, they hesitate because of the lack of education, first, and lack of culture, second. More culture and fine arts will make the city much more attractive to people and businesses. 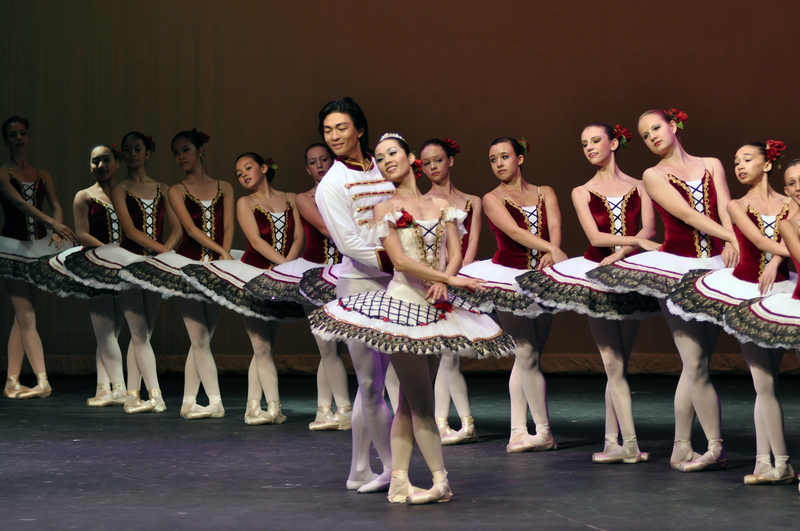 Kwak Ballet Academy and The Las Vegas Ballet Company will contribute greatly to the fine arts in Las Vegas. A: Your academy and company only recently opened. How has it been going for you? KK: Opening my own school was my dream. But everyone thought we were crazy to try this, even our landlord. We spent quite a few months building our classes up. Our roster is now over 70 students, and I can finally exhale. Word is spreading that we offer serious, classical ballet training and so now even professional dancers from the Strip are seeking us out for our training. While we thought that opening a school was hard, putting on our first show seemed impossible, with everything that had to get done! My wife and I did everything – choreograph, teach, tech, lighting, programs, posters, costumes, advertising. And the expense for custom-fit costumes was enormous! For instance, 16 pairs of handmade tutus for the dancers would have cost almost $30,000! Luckily, our amazing tutu maker, Suzanne Dieckmann, generously taught the students’ parents how to make the tutus, so it only cost us $1000, for materials, in the end. It’s caring people and volunteers like this that have made it possible for us to have our shows. All of this reinforced for me that good relationships and good communication with everyone who works with you or helps you is priceless. For many small companies and schools, the costs of costumes are so high that they can’t perform a classical repertoire. But because of all the people who helped us out, we were able to offer a classical repertoire with classical costumes. A: At what point in your life did you feel drawn to dance? KK: I found dancing addictive from a very early age. I was always the first student to get to the studio, and I’d lock up the studio at night and put the key under the flower vase, since everyone else was gone. I danced as long as possible every day. I went to company class and trained from 10a.m. to 6 p.m., and then I would also go to the class that was open to the public, too. I always wanted to dance more, go to more classes; it was the most fun thing to do. Other people would go out to clubs or movie theater or do other things for fun, but I just wanted to dance all the time because it felt like the best thing in the world to me. I met my wife in dance class when I was 17, and we’d go out for coffee after rehearsing all day. We’d look at each other and ask “What do you want to do this evening?” and we’d both answer “go take another ballet class!” We both love it so much! Here at the Kwak Ballet Academy, I focus on classical repertoire, because I believe it is the foundation of dance. If you train in classical ballet dance, you can go into any other form of dance later on, no problem. Ballet builds your strength and technique, and you can use that to do anything else better. It improves one’s dancing quality in every other style of dance. That’s why classical ballet training is valuable for everyone. A: When was your most recent concert? KK: Just last month, May 28 at the Summerlin Library. We had two shows that day, a matinee and an evening performance. The student company performed “Glory”, an original work that I choreographed, and Yoomi Lee and I performed “Paquita”. Unfortunately, I don’t know how we will do more performances, as the library has raised its theater rental rates by tenfold, recently. It would cost thousands of dollars to rent the space, now, and there is no way that even a sold out show would pay for that. Even smaller, older theaters in this area are charging so much to rent them that neither I nor any of the other small dance or theater companies can afford to rent them to present concerts. We’ve all stopped scheduling performances. Musical theater productions, ballet and small dance company performances are gone, at this point – all gone. Basically now there is no place for community-based performing arts to perform. I don’t know how we will find a solution, but I will work hard to find one. I want to give my students and company many chances to perform.